The banner photograph at the top of Blanco’s Blog was taken last year in Granada, Nicaragua at the VII International Festival of Poetry, towards the end of a rather hectic afternoon, on which misery and poverty were cast into Lake Nicaragua, encased in a coffin. Whether or not it worked I am yet to see, but am returning to Granada this weekend, with Mrs Blanco, so may find out. 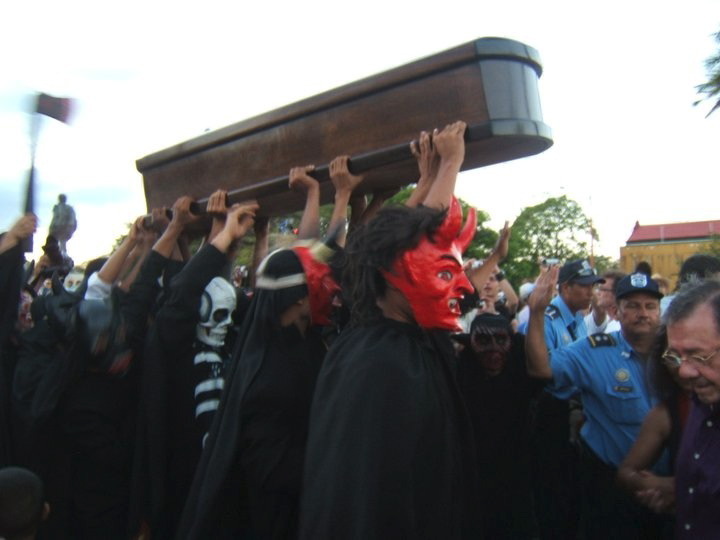 I doubt very much whether Daniel Ortega’s re-election as president will have secured the objectives aimed for by the coffin-carrying devils of last year, pictured here by the Scottish poet Brian Johnstone, but next Wednesday, apparently, Las Lágrimas del desamor or the ‘tears of indifference’ will be done away with and buried. We’ll see how that goes. But to return to the photo on the blog’s banner, a couple of people have pointed out how the black-masked demon pops up behind the three amigos: he is easy to miss, as he seems an integral part of the background. This picture has haunted me for a long time, and I have practically no memory of taking it; everything was happening very quickly, and I certainly didn’t notice the reaper coming up on the left. The Festival is held every February in the ancient city of Granada, supposedly the first to be built by the Spanish on the American mainland. Poets are invited from around the world: last year over fifty countries were represented by around a hundred poets. My main interest is concerned with a project I have been working on for the past eighteen months: I am putting together an anthology of contemporary Latin American poetry. This year, apart from the many poets from Latin America who will be attending, there are big names from the English-speaking world: Derek Walcott and Robert Pinsky (as well, of course, as my other Scottish compadre, Tom Pow).